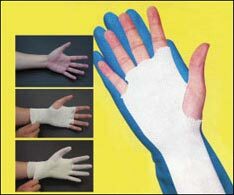 Glove Mate, Cotton Lining for Inner Glove and Over Hand. The Glovemate is a fingerless, blended cotton knit underwear for sweat absorption. It's a liner you wear on your inside the glove. Excellent for sweaty hands. It also helps to act as a buffer between the skin and latex, protecting the skin from contact with latex. This reduces potential for allergic reactions. Stretchable fabric design fits all sizes.